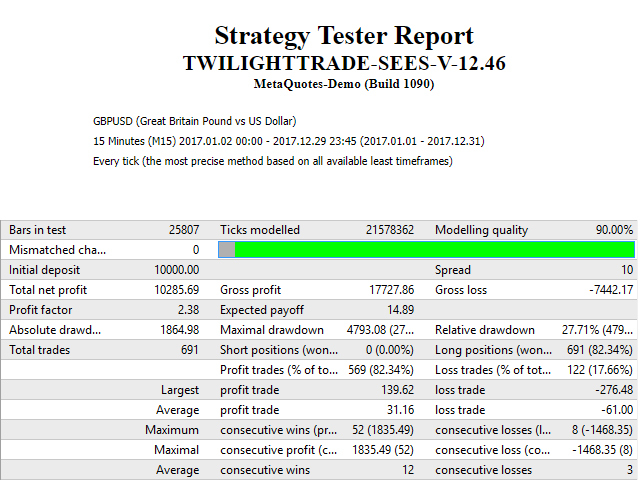 TwilightTrade SEES is an automated Expert Advisor based on level trading strategy, price action and some MetaTrader 4 standard indicators. With Profit Close and Profit Percent, you will control your profit and with no stop loss you will protect your balance. The money management gets the right automatic lot calculation based on your risk per trade. 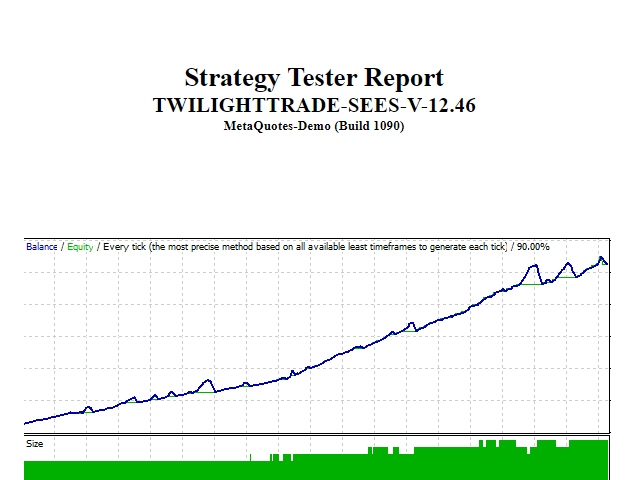 This system uses no grid, no martingale, no arbitrage, no hedges, no tick scalping, and the best part is running fully automatic. Please use this EA on GBPUSD M15. Slippage — slippage. 1-3 suggested - no more and no less. SeeStrend — permission to trade with this strategy. SeeSMove1 — value from 1 to 100. 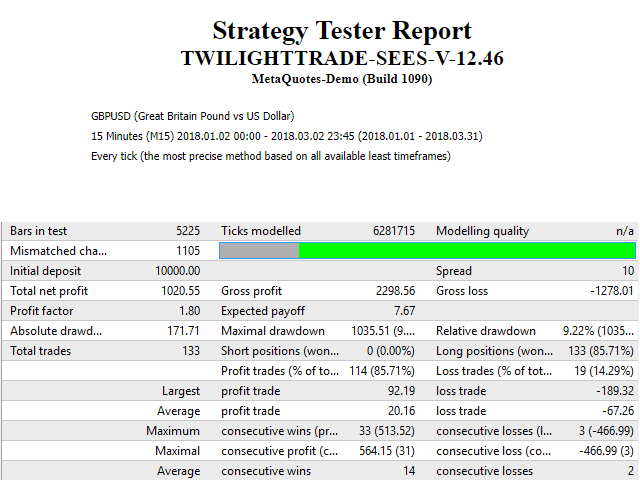 Filter by TwilightTrade. With a high value you get good trades, when this number is low you get many bad trades. MAFilter — permission to trade with this filter. MAPeriod — value from 1 to 100. With a high value you get good trades, when this number is low you get many bad trades. Reverse — permission to trade with this strategy. AddPositions — permission to add more trades. CloseIfOpen — close all trades when opening opposite trades. OneSideBuyOrSell — trade with one side, buy or sell. MaxOrders — the maximum number of orders. SeeSMaxOrdersbuy — value from 1 to 100. The maximum number of buy orders. SeeSMaxOrderssell — value from 1 to 100. The maximum number of sell orders. RiskClose — close all trades in account with your risk percent. ProfitClose — close all trades in account with profit percent. ProfitPercent — value from 0.1 to 100. With this percent the system will close all trades. PROFITCLOSEBUY — close all BUY trades in account with Buy Profit Percent. 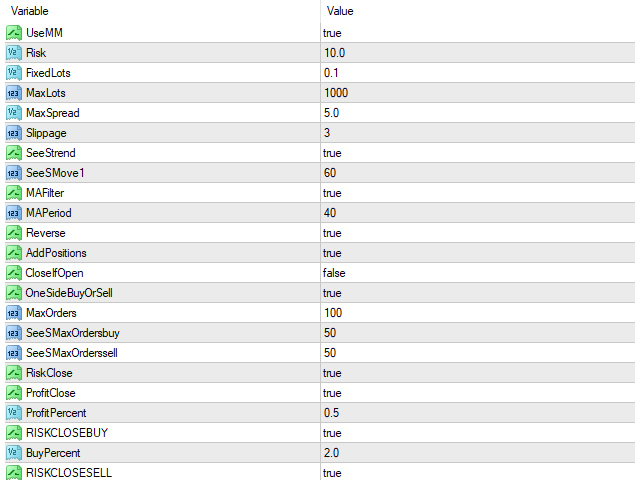 BuyProfitPercent — value from 0.1 to 100. With this percent the system will close all buy trades. PROFITCLOSESELL — close all sell trades in account with Sell Profit Percent. SellProfitPercent — value from 0.1 to 100. With this percent the system will close all sell trades. ProfitTrailingStop — permission to trade with ProfitTrailingStop. Profit Trailing Stop moves the stop loss with profit when the trade reaches the profit value. WhenTradeWin — when the trade wins and reaches this value, the ChangeStopLoss will move stop loss with profit. ChangeStopLoss — value from 1 to 100. Place stop loss with profit using this value. WhenWinStepMove — value from 1 to 100. When this value is over the stop loss, the system will update the stop loss by the StepMove value. StepMove — value from 1 to 100. With this value the system will update the stop loss. Improved algorithm for faster execution and faster orders modification.